Business is an economic activity, concerned with the provision of goods and services with an aim of earning a profit. There is two major classification of business activities, i.e. industry and commerce. The industry is all about the production of goods, whereas commerce focuses on their distribution of goods and services. Industry implies all the activities that are concerned with the conversion of raw materials into finished goods. Conversely, commerce aims at providing goods at the right place, in proper quantity, in the right condition and at right time. In this article excerpt, we have compiled the basic difference between industry and commerce, have a look. Meaning Industry is an economic activity, concerned with the procurement and processing of raw materials into finished products, that reaches the customer. Commerce is a business activity, wherein exchange for goods and services for value, is done on a large scale. Involves Conversion of resources into useful goods. Activities essential for facilitating the buying and selling of goods. Represent Production part of business activities. Distribution part of business activities. Extraction of materials such as coal, petroleum etc. Conversion of raw materials into useful goods like soaps, fans, cement, etc. Construction of buildings, dams, roads etc. Primary Industry: Industry concerned with obtaining and providing natural raw materials like mining, agriculture or forestry. Secondary Industry: Industry engaged in conversion activities, i.e. converting raw material provided by primary industry, into finished products. Tertiary Industry: Industry that provides support services to the primary and secondary industry. The term ‘commerce’ means a business activity that involves buying and selling of goods or services for value (cash or kind) and that too, on a large scale, between businesses or entities, from one place to another. When there is a purchase or sale of a particular item, it is known as a transaction, but commerce refers to all the transactions associated with the buying and selling of that item in an economy. Trade: The process of buying and selling of goods and services for money. Auxiliaries to trade: All the activities which assist trade directly or indirectly are auxiliaries to trade. It includes transportation, warehousing, banking & finance, advertising, insurance and so on. The industry is defined as an economic activity, concerned with the procurement and processing of raw materials into finished products, that reaches the customer. Commerce is described as a business activity, wherein exchange for goods and services for value is done on a large scale. A huge capital investment is required to start an industry. On the other hand, commerce requires comparatively less capital investment. Industry involves the conversion of resources into useful goods. As opposed to, commerce which involves activities that are essential for facilitating the buying and selling of goods. The industry is an indicator of production part of business activities. Unlike commerce which deals with the making goods available to the customers,i.e. the distribution part. Industry involves high risk in comparison to commerce. 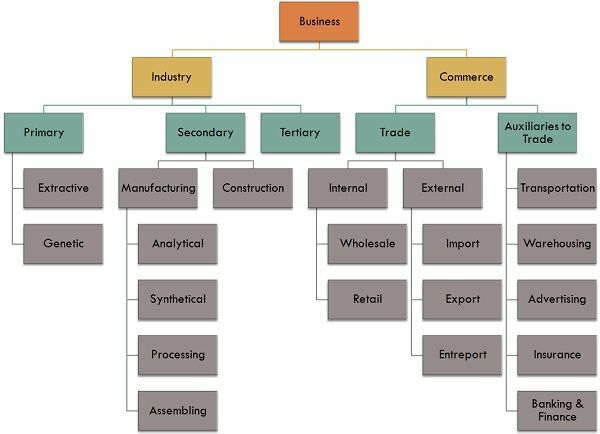 Industry and Commerce cover all the aspects of business. Industry looks after production, procurement, fabrication, extraction, construction activities of business. On the other hand, commerce looks after the movement of product from the source location through distribution channels (such as wholesalers, retailers, distributors, etc. ), to the final consumer.